Issue #1: The "Template" option in a new note is not available in the browser version. Issue #2: In the desktop version choosing the template option leads to an endless loading screen with the usual options for "Template Gallery" and "My Templates" both of which fail to populate and give the endless loading circle. This is a bit weird because just last week I used templates with no problems. #1: I believe that's been reported here. Hopefully they're working on it. A temporary connectivity problem, whether on Evernote's end or on yours. Try again after awhile. A temporary problem in the templates system. Ditto. Something temporarily amiss in the desktop program. For Windows, I find that closing the program completely (File > Exit; clicking the red X box only closes the interface) and restarting it can clear up such glitches. Apologies if you've already tried all of these. They're about all I've got. @Dave-in-Decatur, what specific issue are you referencing? Thanks for the quick responses, gentlemen! @Dave-in-Decatur I'm on my work Mac and tried restarting the program which didn't work. I could close everything, run the cleaner, then reboot and see. For now I have too many things open that I don't want to restart. I'll follow up on this thread if that works at the end of the day here. @Scott T. The link you sent gives me a warning that I'm entering a beta version, which I'm okay with, but then it doesn't recognize my email as having an account. I'd rather not start another account. If this feature is glitchy for now I can wait, but I'm on a trial premium version and am unlikely to buy in if this isn't fixed after my 7 days are up. @Scott T., I was referencing the OP's issue #1, the Web version. I thought I recalled others reporting issues using templates with it--but that must be with the older version, as you say. @MikeG689, I don't use the Mac program, so I can't comment usefully on what might be going on there. Hope it gets sorted! @MikeG689 Regarding the Mac issue, the Templates window with Template Gallery and My Templates makes calls out to our server to fetch templates for these two views. 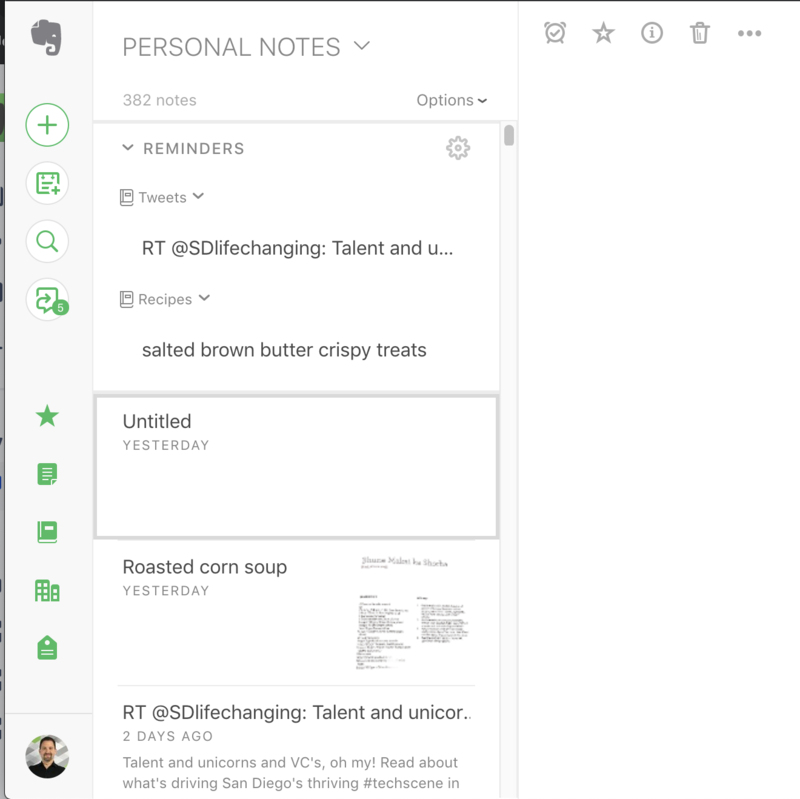 It'll call out to our server at https://templates.svc.www.evernote.com. Is it possible that requests to this might be getting blocked at your work via a firewall or other network configuration? That would explain the spinning circle. As a premium user, you can contact our support team and they should be able to help you out more 1:1 to see what specifically is happening. You can go to https://help.evernote.com and there should be an option to send an email or chat. 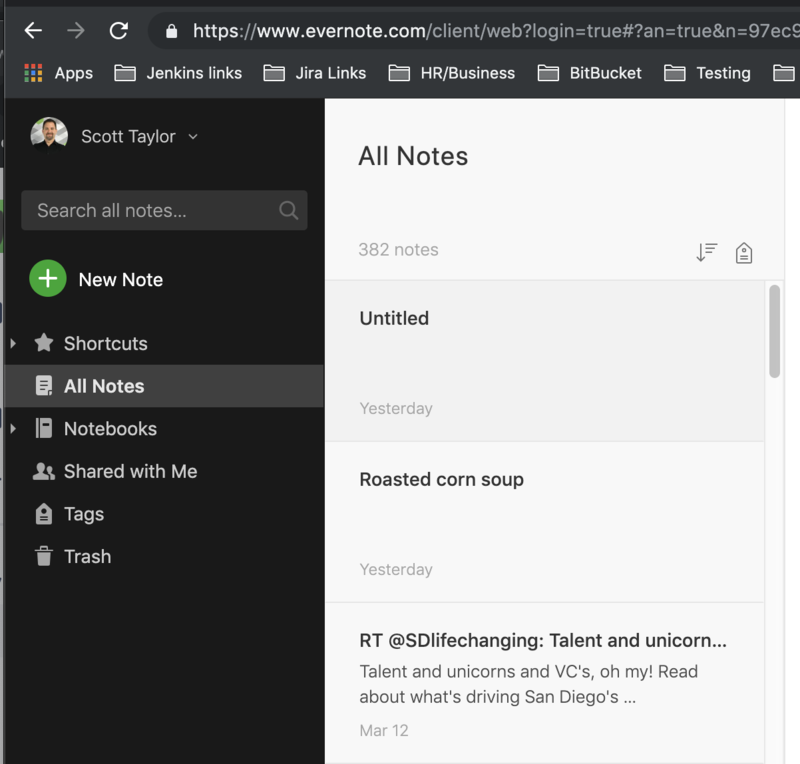 @Scott T. I tried the link https://www.evernote.com/client/web in Chrome and Firefox and the template button still does not appear. I tried it at home last night and had the same problem, but I tried it on my Windows desktop from home and was able to see the button and load the templates immediately. I bet you're right about a work firewall. So now it's just a matter of the template option not being available on the browser version of Evernote. I'm sure it's just a bug and you guys will fix it. I'm growing to appreciate this application the more I use it. Let me know if you discover that there's some correction I need to make on my end. @MikeG689 Thanks for the follow-up! I definitely want to help you figure out what is going on with the Web client. Our new web client isn't supported in Firefox yet, so you should get a message regarding using a supported browser. If you didn't see this, is it possible you switched back to the old one? We provide an option to do that. The link above would redirect back to the old client if you had done this since we set an attribute on the account if you do. Once you've logged in and the page has loaded, confirm if the URL still says "/client/web", or if it says "Home.action". The latter is our old client. If you are on the old client, you can click on your profile image in the bottom-left corner and select "Switch to the new Evernote Web". This should take you back to the new client and set the attribute to prefer the new client. I know the old vs. new client thing is a bit confusing. We're working hard to get all the features of the old web client into the new client so we can ultimately deprecate the older client. But some key features are still missing, such as Notebook Stacks and WorkChat. But we're actively working to bring those into the new client (very soon). @Scott T. I have a free account I use for work and on Chrome the template option is there. I may not have tried Chrome on my Windows desktop at home but will tonight. I expect it will be there. Considering I can get to the templates through Chrome I think my problem is solved. I hope it works on Firefox before long, but I'm good for now. Thanks for your help. @MikeG689 Glad to hear it's working for you in Chrome. Firefox support should be coming sooner than later, from my understanding. Don't have a date, though. Make this sooner than later, please. I like FF and do not want to install yet another browser.